For well over a year BuzzFeed UK has been polishing its visual style. As part of the brand refresh, the site has been developing its typography, photography and illustrations to give the site the feel of a glossy magazine. The latest piece of the rebrand, includes a new logo design and bespoke typeface inspired by the jagged trending arrow. Created by Tim Lane, Buzzfeed's first in-house art director outside of the US, the distinctive new logo and typeface are described as a big step towards cementing the platform's redesign. In an exclusive interview with It's Nice That, Lane reveals that he imagined that the arrow was a character in a typeface and built the design from there. "I feel this design is more reflective of the UK's visual output. It gives us our own identity and aesthetically separates us from the rest of the world. It's still 'BuzzFeedy' but with a UK twist. It’s well overdue that we take ownership." Another key part of the design is the distinctive 'BuzzFeed red' which helps to keep the new logo consistent with the rest of the global branding. 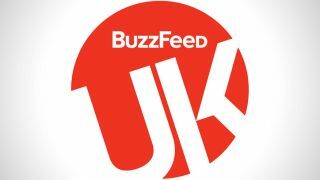 At the moment BuzzFeed's bespoke typeface is only being used for the UK logo, although it is expected to be used in article headers across the site. While it isn't the only font BuzzFeed will be using, the site is expected to significantly reduce the number of typefaces readers will see. Considering that 75per cent of BuzzFeed readers access the site on smartphones, Lane ensured that the rebrand, along with the rest of the platform's design work, is mobile-first. At one point the stripped down design saw the logo become 'BF UK', but it was decided that this strayed too far from the main brand. With a mix of sharp angles and curves, the 'Buzz UK' font is a strong blend of elements that reflects the mix of content BuzzFeed readers have come to enjoy, all while staying in-keeping with the overarching BuzzFeed style.